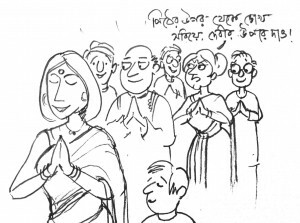 Once again, the time of the year for all Bengalis around the globe has arrived. There is a nip in the air, the sky seems to have a brighter shade of blue with white clouds drifting casually, the leaves catching on that orange tint, and we know that Durga Puja is here in New Jersey. The Bengali clubs around the Garden State has geared up to welcome Maa Durga with the usual fervor, and here I am back again to give you a brief preview of the festivities being arranged for you. Read, think, budget, and then click on the registration link of the Puja of your choice. The registration fee is quite reasonable, $130 per family, $75 per individual. So if you are looking for a homely and “not so crowded” Puja celebrations, ICC-GS may your destination of choice. Kallol of New Jersey will be celebrating their Puja from Friday Oct 11 to Sunday Oct 13 at their usual venue, the Ukranian Church and Cultural Center at 135 Davidson Avenue, Somerset, NJ. Kallol has announced an impressive line-up of guest artistes as well as domestic performances for the three evenings. On Friday evening, the popular Bengali singer Rupankar Bagchi will grace the stage. Saturday performers include, young and talented Hindustani Classical vocalist Sandipan Samajpati, semiclassical and modern songs by Nirmalya Roy and Suchismita Das. And on Sunday, Sa-Re-Ga-Ma 2013 champion Jashraj Joshi with his Lambada band will rock the stage. Local performances will include, children’s drama “Cyberella” written and directed by Aparajita Das, adults drama Sunil Ganguly’s “Raja or Rani” directed by Nupur Lahiri, dance choreography by Sunrita Mitra and many others. Kallol has also announced their dinner menu for the three days. Kallol registration fee schedule is quite complicated, since they offer a wide range of permutations and combinations – members, non-members, students, daily, season, below 12, between 12 – 18 yrs, above 18 etc. So to give you an idea, if you are not a Kallol member and you want to attend the Puja on all three days with your 14 year old son and 11 year old daughter, it will cost you $250. But if you are a member, it will cost you $200. If you want to ensure your seat amongst the first few reserved rows, you need to be a Donor or a Patron and need to spend $300+ (the math gets a bit fuzzy here). Saturday: Manjari School of Performing Arts, Kalamandir Dance Company and vocal music by Jayati Chakraborty from Kolkata. Sunday: Art N Beat, Performance by GSCA (Production of GSCA), Rhythms of Dance and Music (Nilanjana), Rajdeep Chatterjee and Jonita Gandhi. As per the tradition, GSCA also offers sumptuous dinner on both evenings. The registration scheme is simpler – 2 adults and 2 children (less than 17 yrs) will cost you $210 at the gate, but you’ll receive significant discount for registering early. 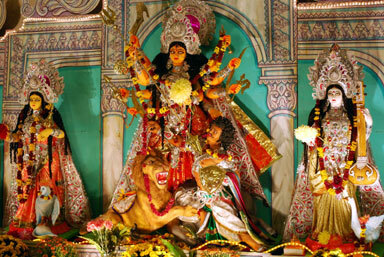 The other Durga Pujas in this region are celebrated by Anandamandir and Bharat Sevashram Sangha, following the traditional Bengali calendar. 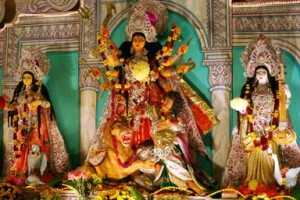 These Puja’s pay more attention to the Puja than the cultural entertainment programs, although both have some programs in the evenings mostly by local talents. Dinner is served on all evenings but it is typically a simple vegetarian fare. So if you want to pay your tribute to Ma Durga in a traditional temple like setting, Anandamandir or Bharatsevashram Sangha may be your choice. However, parking can be an issue at both the venues due to recent constructions. 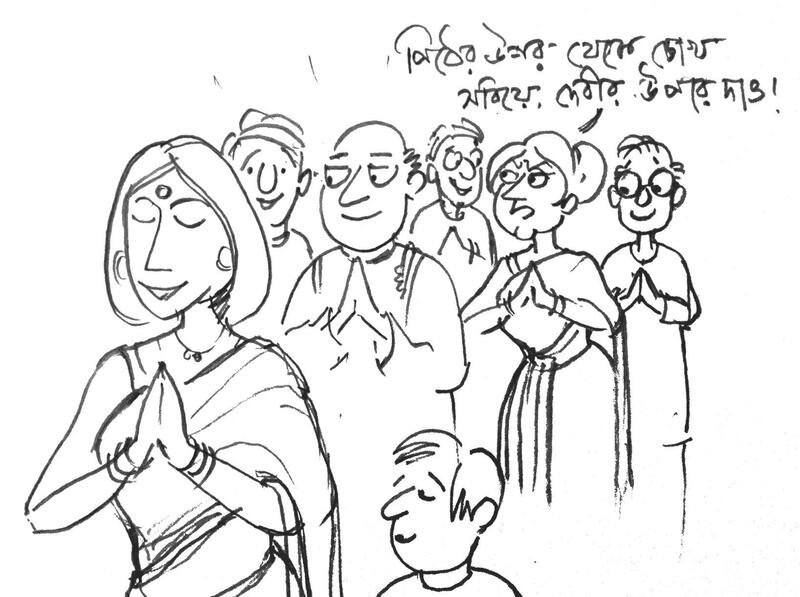 I hope you all have a great Durga Puja. Enjoy all the sights and sounds the festivals have to offer and hope and pray for better times ahead. I enjoy all the sights and sounds the festivals.